Want to show off your coffee mug collection as a decor feature? You need one of these easy DIY coffee mug holders and racks at home. How big is your coffee mug collection? It gets bigger and bigger after Holidays, birthdays and other special occasions. And how many times you’ve bought that cute mug you’ve seen and fallen in love with? You need to display all of them and make a decor feature. Here’s how. 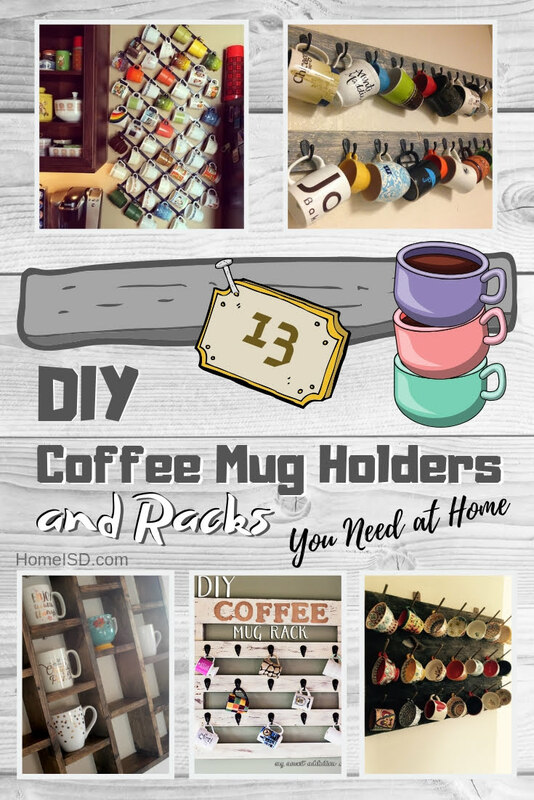 We’ve picked 13 easy and great looking coffee mugs and racks that you can DIY at home. They will make putting your mugs on display easy and visually appealing. Check them out and try one out! For a simple but visually attractive mug rack, all you need is a couple of boards and coat rack hooks. Essentially any coat rack would do with enough space between the hooks to hold the mugs. 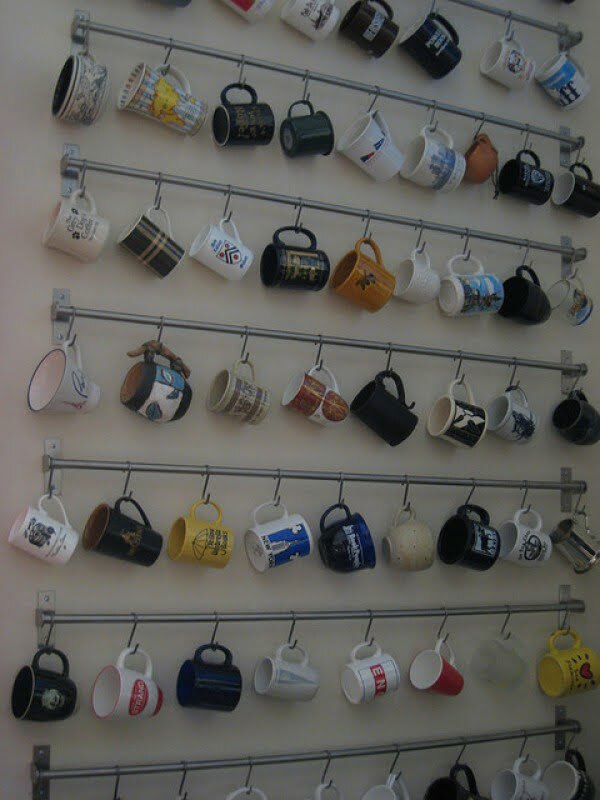 You can craft a great coffee mug rack that has plenty of room to hold your entire collection. For this project, you can use pallet wood or 2×4 boards. 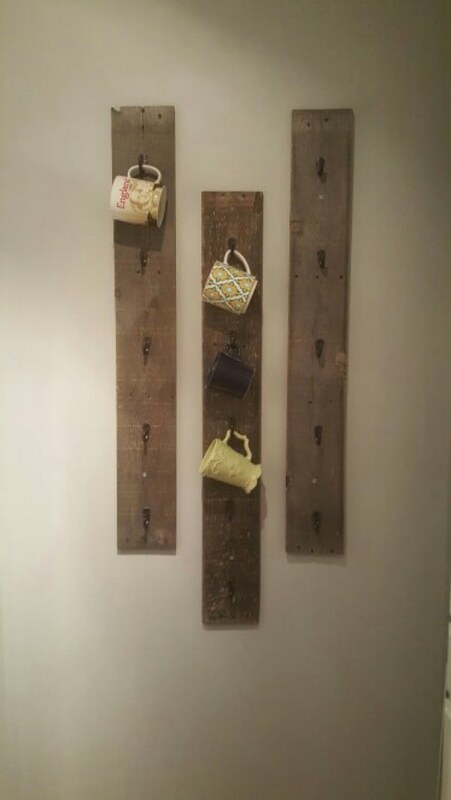 Here’s an idea for a big coffee mug rack in rustic style. You can use scrap wood and masonry nails for the most significant rustic effect. It’s all about recycling old materials with this project. 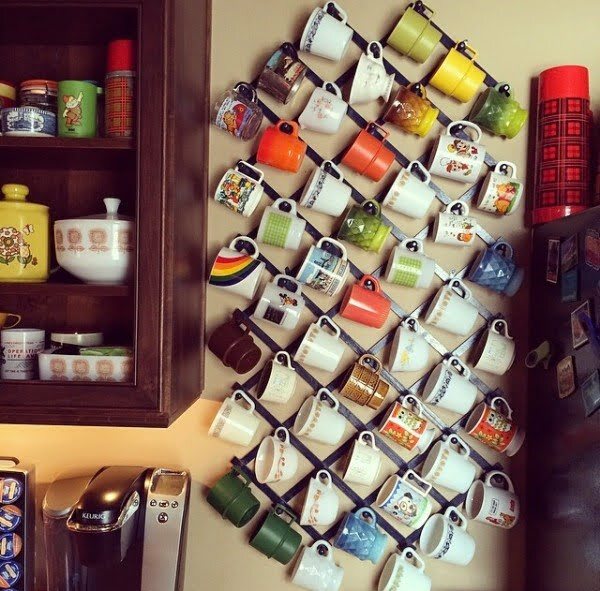 If you want something more classy, build this coffee mug display shelf. All the small compartments are designed to store individual mugs, and it makes a real showcase of your collection. 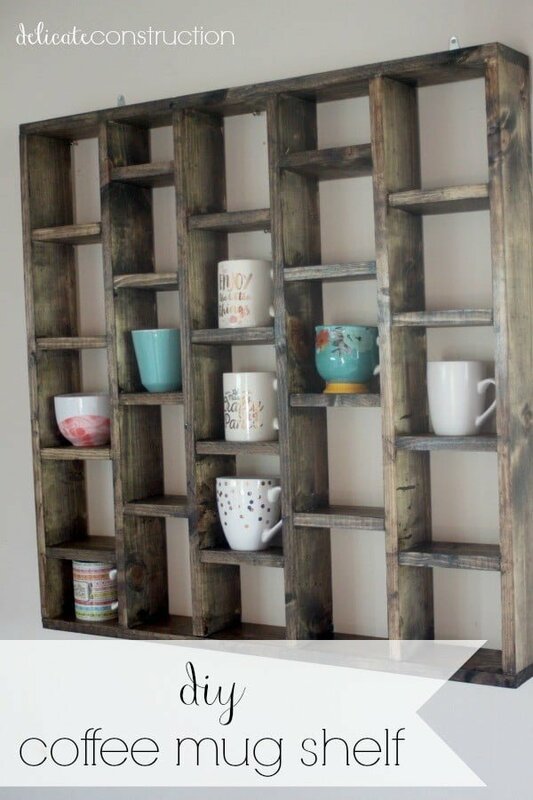 If all you have is a side of the cabinet to spare for a mug rack, then this project is definitely for you. Alternatively, you can even add the hooks straight to the side of the cabinet. 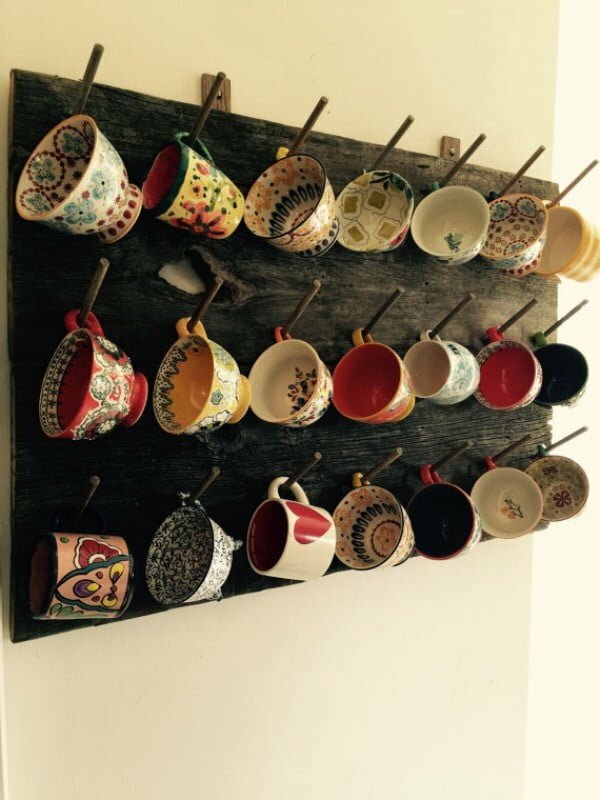 For a mug collection that’s big, this mug rack idea is precisely what you need. You can make it as big as you want and put all of your mugs on display. We’re all about saving space when it comes to storage, and this DIY project makes use of dead space effectively. 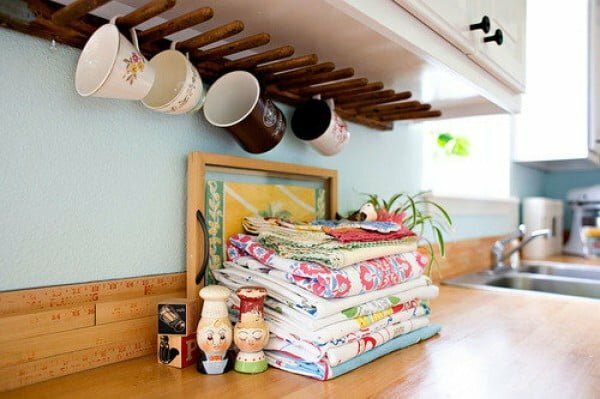 The area under the cabinets is often unused, and you can fit the perfect mug rack there. Here’s another idea to save some space and use your shelves more effectively. Add little hooks to under the shelves for a quick and easy mug rack. If you don’t have a lot of free wall space to hang mug racks, these vertical board mug holders will be handy. The idea is to use scrap wood for a rustic accent. Creating a mug holder rail is easy – you can use a curtain rod for that. It gives you plenty of room to display even the biggest of mug collections. If you want to display your mugs with style, use this idea of small drawers to create display shelves. The idea is simple – all you need is to find drawers of the right size and mount them on the wall. It doesn’t get any more simple than this. 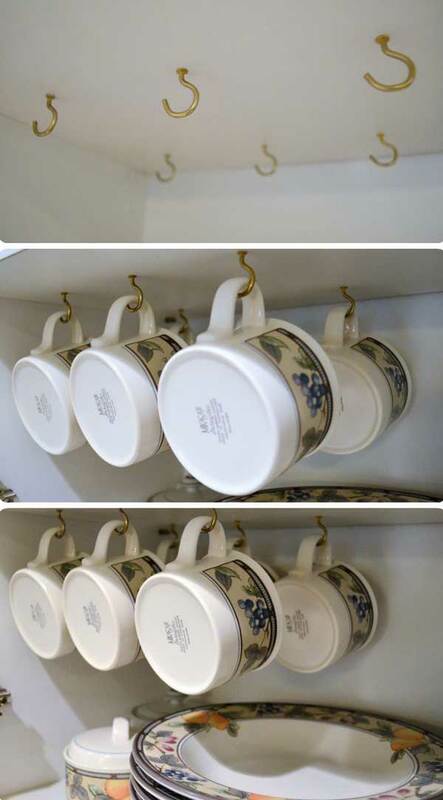 All you need to do is to add small hooks under the cabinet to hold your coffee mugs. The space is only limited by the size of your cabinets. What can you make of an empty side of a kitchen cabinet? A lot if you use your imagination. One of those things is the perfect mug rack which you can easily install. Check out the tutorial for all the details of this idea.